such as OpenVC and the UTV007 Driver for a Video Grabber. Does anyone know which ToolChain I need and where I can find it to actually do it? Also it would be very nice if someone has some links (tutorials, or detailed descriptions) on how to actually cross Compile kernel modules. @Adrian-Rix Feel free to SEARCH through the numerous posts of this community forum using relevant search keys. You'll have to assemble this puzzle to have the big picture. @Adrian-Rix The Omega2 runs on LEDE, which is a distribution build system which includes building the cross compile toolchain, the kernel plus everything around (packages) and finally a bootable firmware inage. For the Omega1 (based on OpenWrt, of which LEDE is a fork), Onion has a nice getting started entry in the wiki. For doing the same with LEDE for Omega2, you can follow these instructions, except that in Step 3 you need to replace "git clone git://git.openwrt.org/15.05/openwrt.git" by "git clone -b image https://github.com/WereCatf/source.git". In Step 5 of the instructions, in menuconfig, you need to select "MediaTek Ralink MIPS" for target system, "MT7688 based boards" for subtarget and "Omega2" or "Omega2p" for profile. Of course, the produced binaries will have different names (not ar71xx, but ramips etc.). My 2 cents: I find LEDE/OpenWrt a fantastic and very cleanly set-up distro building environment, very nice and (relatively) easy to work with once you understand the basics. As with everything on that complexity level, it's not a single click experience, but I found it definitely worth digging in a bit to understand the concepts. Both LEDE and OpenWrt have very helpful wikis; for understanding the build system I found this OpenWrt page particularily helpful. @WereCatf you really got me with this. Sorry! And thanks for the hint. It really makes me think, realizing how easy it is to still fall into that trap of blindly assuming a "he" behind a unknown nick in a tech forum. What would be the right thing to do? Google first? Use (s)he in general? Avoid pronouns? Just ask? @luz Assume 'HE' unless the username is clear, or the user corrects you. ;-) We are brainwashed by politically-correctness. @fossette political correctness is not the point here (at least not for me) - what made me think is that I imagine a person when discussing, and imagined a "he" without thinking. but on my VMs I have not been able to compile the toolchain (or even the LEDE image). On both system the compiling process failed. This is the output I am getting on Ubuntu when using "make -j1 V=s"
@Adrian-Rix I haven't seen that message myself so far, but it seems to be related to the recent aim to create reproducible builds. 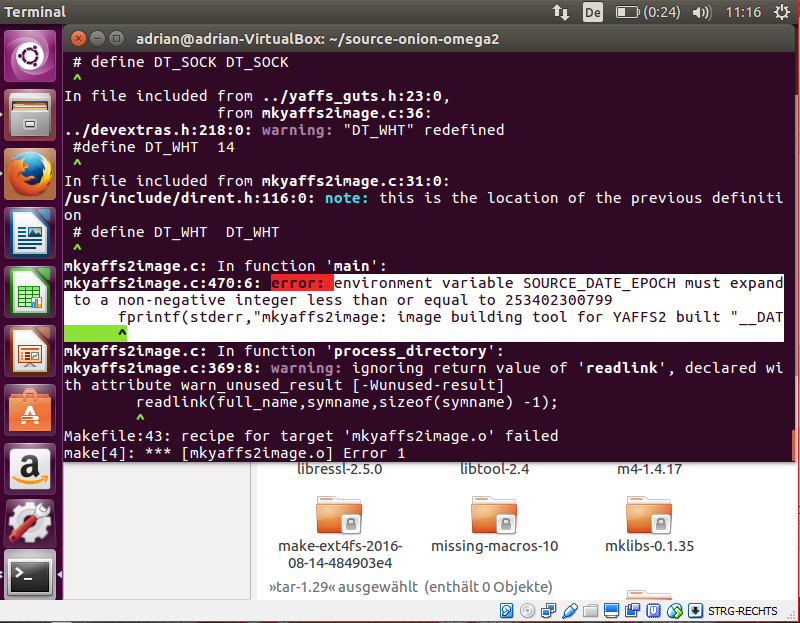 Apparently, for some reason when building mkyaffs2image the SOURCE_DATE_EPOCH is not defined as it should be. What LEDE commit did you check out? @WereCatf's master? If mkyaffs2image is the only tool giving problems, and the omega does not need YAFFS at all, maybe there's a way to disable building that tool (apparently not via menuconfig, I just checked). Regarding my build platform - I'm using Mac OS X. Works great for me, the only thing I had to work around is that OpenWrt/LEDE needs a case sensitive file system, which OS X can do, but does not have by default. So I just have the LEDE tree within a separate, case sensitive disk volume (a mounted diskimage). managed to fix the problem. I was finally able to compile everything. but via Firefox so the TOPDIR Folder had an other name. The next Problem was that I tried to build it with an user with root-privileges. After i figured out everything I had no more problems. Where in the sources can I actually find the kernel sources. the sources were downloaded before the got compiled. When I checked the kernel dir in the build root I only found dirs with just a makefile. @Adrian-Rix LEDE itself is no just a heap of sources + makefile to build something, as a single project (even the Linux kernel) is. LEDE is a "distribution build system", which means it is kind of a meta-level above what one usually refers to for building a tool or library from source. prepare everything around, in particular the toolchain (compilers, linkers, etc.) needed to build code for the target (=Omega2/MT7688 in our case) platform. only then, the regular build process (often autoconf/configure/make, cmake but also others) is started. So in a freshly downloaded LEDE source you don't find the kernel sources, just the recipes (makefiles) how to obtain them. That's what you see in target/linux/ for a large number of different targets. "ours" is target/linux/ramips/ with some specifics in target/linux/ramins/mt7688. Similarily, package/ contains recipes for userland (and other not target specific) stuff, and /feeds contains collection of separately maintained recipes for more software. Feeds can be from third parties, like feeds/onion/ is. But note, dl/, build_dir/ and also staging_dir/ are temporary. As soon as the LEDE makefiles consider something changed, sources will be re-downloaded. So build_dir is not a good place to actually develop. There are mechanisms in LEDE to have it use an out-of-tree development folder for a package under development (keyword USE_SOURCE_DIR). This is just an attempt to make the overall picture more clear - head to OpenWrt's wiki and also to LEDE docs for more information. Now I know everything I need to know an the rest I can figure out myself (I guess :D ). I tried the above instructions, but menuconfig does not show a MediaaTek Ralink MIPS target. Is this still valid? Assuming you got a current LEDE, such as the stable 17.01 branch from github: In menuconfig, under Target System ---> (first menu option), you should be able to find the MediaTek Ralink MIPS option. Once this is selected (but not before! ), in the Subtarget ---> menu you will find MT7688 based boards. Once this is selected (again - not before), in the Target Profile ---> menu Onion Omega2and Onion Omega2+ will appear. Then, you can type make and (depending on your machine) in 1-2 hours you'll have a stock LEDE image in bin/targets/ramips/mt7688 that will work with the Omega2. Note however that this is not the same as the Onion provided firmware - altough LEDE based as well, the latter is still not fully published, unfortunately. @luz OK. I got it and it's all built. Thanks. How do I do cross-compiling for an individual app? This will produce a *.opkg package in bin/packages/mipsel_24kc/FEEDNAME. This can then be copied to the omega2 and installed with opkg. Setting up your own feed with your own packages is not entirely trivial, but not really difficult either (with some time invested in reading up). I think it's worth doing, to get a nicely organized build. If all you need is cross-compiling a binary without packaging, you could probably directly use the tools from the toolchain LEDE has build for you in build_dir/toolchain-mipsel_24kc_gcc-5.4.0_musl-1.1.16. You'd need a bunch of environment settings to direct compiler and linker to the correct headers and libraries - but I don't have practical experience with that.